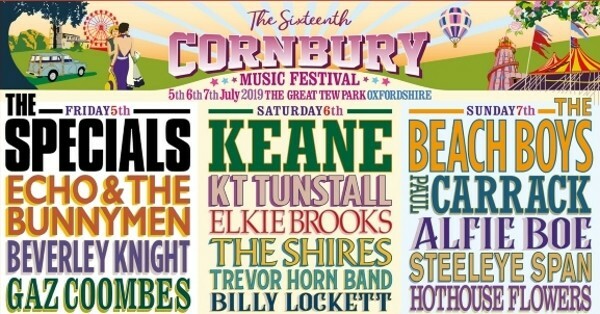 The sixteenth Cornbury Music Festival is back again for another fantastic line-up of guests including headliners...The Specials, Keane & The Beach Boys! We have a pair of standard weekend tickets including parking and camping option to give away to one lucky person. In short, The Cornbury Music Festival represents classic summer entertainment for a friendly crowd from all walks of life. A country fair with a rock ‘n’ roll twist; a farmers’ market with a dancefloor; a local carnival with a classic contemporary soundtrack. Please provide your name as proof will be required. The winners will be drawn at random on Monday 2nd June 2019 and will be contacted via email. The winner will win a pair of standard weekend tickets including parking and camping option for the Cornbury Music Festival 2019.